The Housewife That Is a Writer. My blogging book is done and out! Starting early this morning it will be free for the next 5 days. 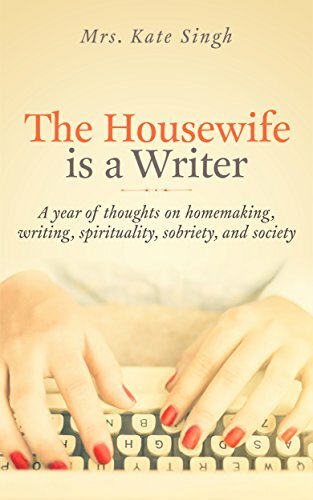 It is a plump book with a year’s worth of blogs on homemaking, frugal and green living, building a writing career while running a home, and plenty of advice on everything in between. There are 3 sections so you can skip around and choose what you’re in the mood to be inspired on. I only hope it is as fun to read as it was to write this last year. Previous Amish fiction, preparing for winter, and homemade vegan egg rolls! Next Ideas on running a full house effectively and easily. Evelyn, I’m still laughing at that title “If you didn’t bring it, you ain’t got it!” I so wish you would write a book. See, I’m laughing now. That will be my private joke from now on. I think one day I will pack the boys up and come find you. Oh please don’t–I am not anywhere near as clever and interesting in person. I am thinking about the book, even starting a little research. We’ll see…. I’m still not sure about writing a book, but if you want to laugh ay my mountain living, I thought you might like this video from my old YouTube channel, Bible Babe. It’s called ‘Redneck Lumberjackin’. Enjoy! I just got your book and started reading it. I had to quit and come over here to give you an encouraging, truthful word. I read one of your other books and loved it. I am a couple chapters into this one and can tell I will love it also. What I love about you is that you say things that I can relate to. I am a young 66 year old (😁), so I’ve raised my boys and now have grandsons, but I wish I would have had your books back in the day! I was a stay-at-home mom, who had to watch her pennies also. I did have the advantage of family all around me. My mother in law used to tell me I needed to work and I really resented it although I loved her. I know she meant well, but I wanted to be there to raise my kids. When they got a little older and went to school, I cleaned houses to make some money and so I could get them off to school and be home when they came home. I say all of this to say I “get” what you are saying and I know there are many young women who need to read what you are writing about. Keep it up and put a few more dollars on your books. They are worth it and you just need to understand that and not get discouraged. Believe in yourself and others will believe in you also. Thank you and thank you again. I was sooo hesitant to make this book and I was bracing myself when I published. I will add a buck or so to some of the books. Funny you said that as I was just thinking that last night. I bet your kids are so very grateful you stayed home. I know some of my family judges me on things like homeschooling and nursing “too long” but it’s for my children and not them and I remind myself of that. I’m sorry you didn’t get the support as a homemaker. It is a job and such an important one. I am a young 47 years old and I hope to be a young 66 year old too as my boys will still be young. Thank you for reaching out this morning and supporting me in just that way I so needed today. Also, a lot of photos have been omitted from the book so you can see them on the blog when I talk about the house and fixing it up and such. Also, I started writing these books for that very reason, to support anyone who wants and needs to stay home and raise children or be a housewife. I want us all to know that it is valuable and makes the family life so much better. So, I’m glad that is what the books are doing. Amen!! I just left a comment on you “about” page, but I also feel like my place is at home, even though my son is 12 and in school. We only have one child, but a recent surgery has made working tough and I’m so much more calm and at peace when I am home in my element, taking care of my family. I hope to be working my way home eventually, but paying down the bills is top priority first. I really hope you can stay home as well. Even when the child/children get older is beneficial for a mom to be home. Even when the kids aren’t home and you are a housewife…that helps support the provider and makes life sweeter for everyone. I give a ton of tips on living frugal, saving, paying off debt…I want whom ever desires to stay home to have this made real for them. Good luck! Oh, and for heaven’s sake–just cram all your sheets, fitted and flat, into the pillowcases, stick them into a bin on the shelf of the closet, and give praise to God that we don’t have to IRON the darn things nowadays! Problem solved! Great advice Evelyn. You definitely won’t be winning any House and Home awards. But we support this sort of behavior. I would rather win the “Life is too short to fold underwear’ award! It’s free if you have kindle!? You’ll enjoy the TWG. Don’t you fear, God makes a way where there is none. How is the house situation? We’ve paid 400.00 paying some more the beginning of the month hopefully okay we hope. No chance ty could evict from us buying this from what I’ve researched. Good hopefully. We’ll know morecthe beginning of the month! Thank you and prayers please! Thank you for liftinge up during my darkest days. It’s helped tremendously! We wont have it all hubby thinks we’ll be okay. We would have to move if nothing else. 3 acres one day hope to have a nursery maybe who knows! Hope not I have plans to grow food lots of it and other things! Oh heck–I just noticed my simple link to a video ended up taking up a big chunk of the page. I’m sorry–thought you would just see the link to click on. Delete it if you want. I am NOT tech savvy.